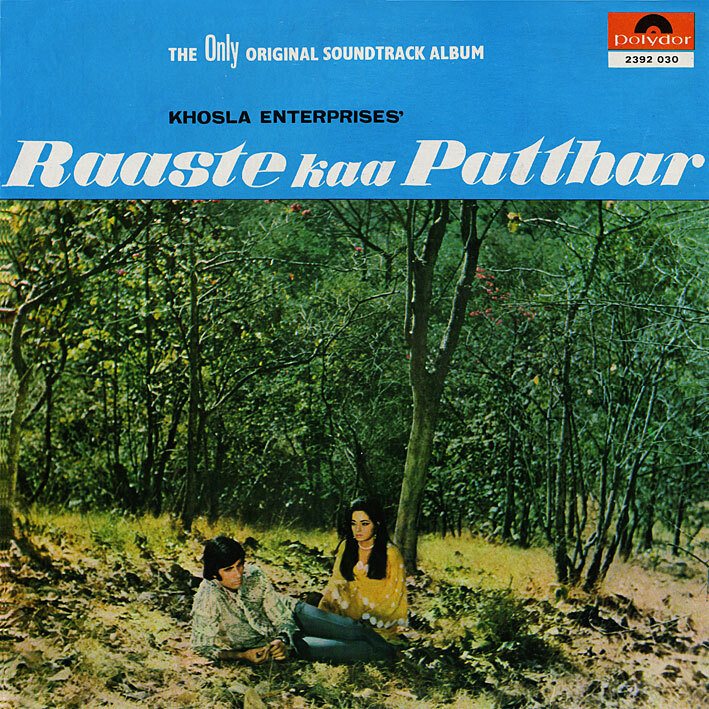 I'm not sure how much the typically compressed 70s pressing has to do with it, but to me the soundtrack to 'Raaste Kaa Patthar' [review] sounds like a demo; made in a garage. Albeit a large one, to fit the orchestra, but still. There's a rawness to it that I don't hear on most other Bollywood albums - and it's all the better for it. It sounds dramatic, loud, distorted, full of jagged, jerky rhythms; I love it! It's hard to pick highlights on a record that's more or less terrific from start to finish, but let's give it a go: 'Main Sharab Bechati Hoon', starting off with an ominous flute, angry guitar strums and loose percussion, is a gorgeous ballad interspersed with a variety of cool, upbeat breaks; 'Theme Music' is a wild and wonderful organ laden soul jazz instrumental with spaghetti western guitar bits and frantic horn solos; and the amazing 'Ma Ma Ma Ya Ya Ya' sounds like a jubilant carnival number, perhaps as played by old school Motown session musicians. Get this one! And Merry Christmas. Merry Christmas and a very Happy New Year to you! Coming back to this soundtrack, this is one sheer underrated soundtrack which somehow has wiped out from the memories of an average listener. Anyways thanks for discovering this sheer masterpiece and literally dragging it out from the pages of history. Keep up the Good Work and give us a glimpse of what's in store for all of us. You are the Santa of our lives! Thanks PC and Merry Christmas! Thanks for the great tunes! Thanks once again for another great album. Hope there's more L-P albums to come from you in the future. Yes, PC disguised as ol' St. Nick has left another stocking stuffer for us all to enjoy. Merry Crimble and a and Happy Goo Year, bro! Amazing! Great Christmas present for us all, thanks again PC. A very Happy & Prosperous 2010 to you PC and all other regulars here. Hey PC ... do you have "Mera Gaon Mera Desh" by Lax-Pya? I have the vinyl but not way to make a digital copy. It's a beaut and I (and I assume many others) would love a digital copy. Nope, don't have it I'm afraid.